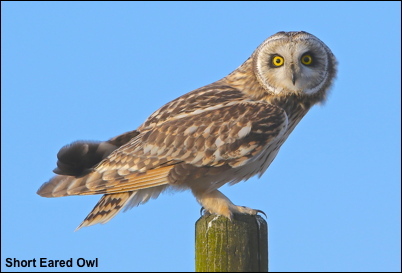 It is hard to believe that this weeks Short Eared Owl has just spent four months hunting voles only five miles from Manchester Town hall. It left on the 30th April and is now on its way back to Scandinavia with others of its kind after the biggest influx of Short Eared Owls in living memory. Apparently on one day last October thirty eight Short Eared Owls were on a sea cliff on Fair Isle sheltering from the wind!